Once again, the weather gods smiled on Cape Town as the Sanlam Cape Town Marathon was held in near perfect conditions. 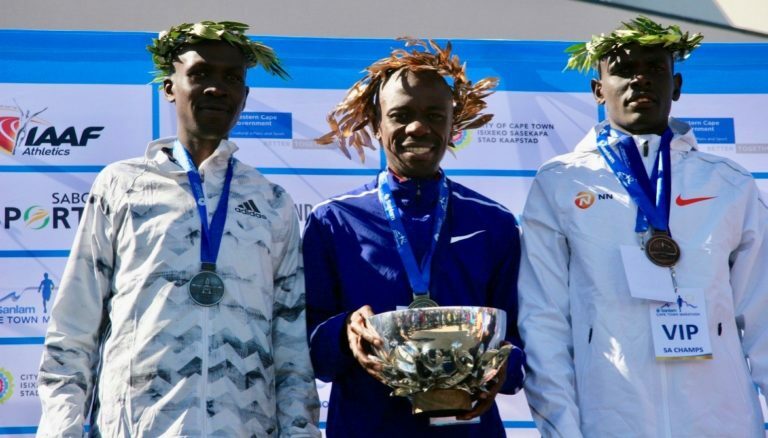 And South Africa’s Stephen Mokoka took full advantage of those conditions to destroy arguably the best field yet assembled at Africa’s only IAAF Gold Label Marathon. Mokoka stuck with the pacemakers like glue until the first dropped out halfway with the second pulling off at the 30km mark, before breaking away from Kenya’s Philemon Kacherian at 33km. From there, the 33-year-old took control of the race and forged ahead. ‘I felt good and decided to go, but I only relaxed and knew I had won the race when I hit the mat at the finish. You know in a marathon, it is never over until it is over,’ said Mokoka. It was a good day at the office for Mokoka, as he not only won his first marathon on South African soil, but he did it in emphatic fashion, breaking the previous course record of Asefa Negewu by 10 seconds. Mokoka crossed the line in 2hr 08min 31sec. Mokoka went through halfway in 1:04:43 with a group containing all the leading names of Albert Korir, Kacherian, Kenneth Limo, Fikre Assefa and Kipsang Kipkemoi all bunched together some four seconds ahead of Mokoka. But the wily Mokoka judged his race to perfection as he started to take control of the leaders just before 30km, covered in 1:32:02. Three kilometres later, he put in a surge that broke the back of the rest of the field. Mokoka covered the 10km from the 30km mark to the 40km on 29:36 and the final 2km in 6:46. 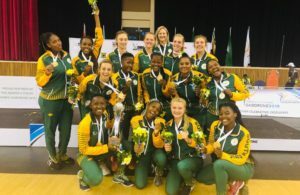 Not only did Mokoka win the overall title, but in the process was also crowned the South Africa champion. Kenya took the next four places as Korir passed a tiring Kacherian in the final two kilometres to cross the line in 2:09:02 with Kacherian third (2:09:13). Fourth place was also under 2:10 as Kipkemoi came home timing 2:09:21. Nicholas Rotich rounded out the top five with a 2:12:39. ‘Winning here in South Africa is a big deal for me,’ said Mokoka. ‘I usually go to Shanghai for my annual marathon, but when I was invited to Cape Town, I knew I had to run here. ‘And winning here is very important to me. Having a home champion is important.’ Mokoka is about to become a father for the first time and the win [R265,000] and the course record incentive of R100,000 will be a welcome cash injection,’ said Mokoka. 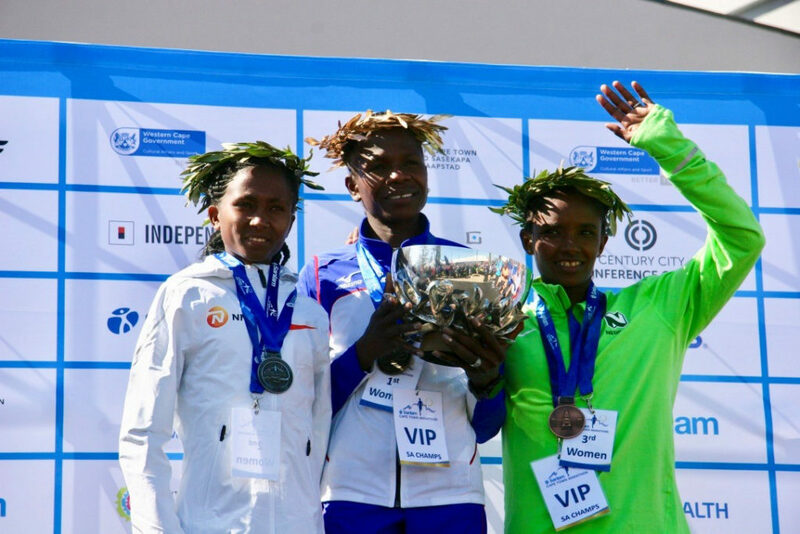 Namibia’s Helalia Johannes (above, centre) went one better than in 2017 as she came home for the win in a course record time of 2:29:28 – some 52 seconds inside the previous course record of 2:30:20 set by Isabella Ochichi of Kenya in 2015. Johannes made her move around 37km into the race where her surge dropped Tanzania’s Failuna Matanga who had done much of the early pace-setting. 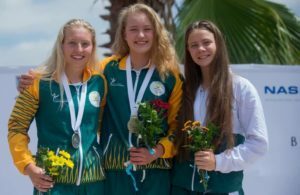 ‘It was great to win after last year when I was the pacemaker. This year it was all about the win and breaking 2:30 and the course record was big for me. I wanted this win very badly,’ said Johannes. Halfway came and went in 1:16:31, with all the main protagonists keeping a close eye on one another. But when Johannes started to push the pace close to 32km, the pack broke up very quickly and at 37km she moved clear of Matanga to come home with a 32-second winning margin. Matanga crossed the line in exactly 2:30:00, also inside the previous record with Ethiopia’s Urge Sokoka Diro rounding out the podium (2:30:31). ‘I like running in Cape Town, so I am looking forward to coming back next year if I am invited again,’ said Johannes. The Sanlam Cape Town Marathon also doubled as the South African Marathon Championships as well as an Olympic Qualifier. Stephen Mokoka claimed the men’s title and Nolene Conrad who finished eighth overall is now the South African champion, crossing the line in 2:34:39. The Sanlam Cape Town Marathon will be home to the National Championships for the next three years until 2020.